Can we please talk about this cake? Because seriously. Look at that thing! This was my daughter's birthday cake she chose last summer. Although I am not a big chocolate cake fan, I will say she has good taste. Because honestly, I don't think you could get more intense chocolate than this cake right here. I also like the fact that it's totally non traditional for a typical birthday cake. So, if you are a chocolate lover, you need to make this cake. 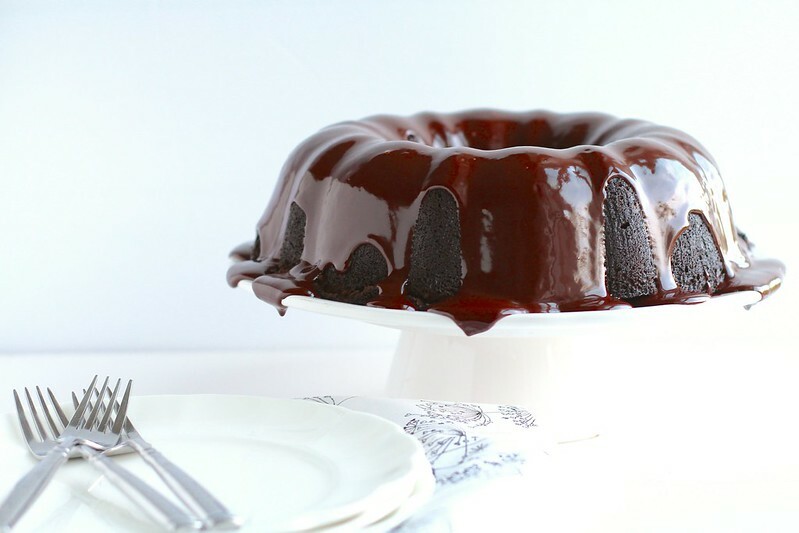 The cake is rich, but because that isn't enough, a creamy chocolate glaze is poured over the top to create a well of chocolate in the middle. Perfection. This makes a wonderful every day cake, or a great special occasion cake. Preheat the oven to 350ºF. In a small bowl, whisk together the cocoa powder and melted butter. Use a pastry brush to evenly coat the inside of a 12-cup bundt pan. In a medium heat proof bowl, pour the boiling water over the chopped chocolate. Let stand for a minute, then whisk until smooth. In a medium bowl, combine the flour, cocoa powder, confectioners’ sugar, and salt. Combine the eggs and vanilla in a liquid measuring cup and beat lightly. In the bowl of an stand mixer fitted with the paddle attachment, combine the granulated sugar, brown sugar, and butter. Beat on medium-high speed until light and fluffy, about 2 minutes. With the mixer on low speed, add in the egg mixture just until combined. Add the chocolate mixture and mix until incorporated. Mix in the dry ingredients until just combined. Spread the batter evenly into the prepared pan. Bake for about 45 minutes or until the edges of the cake begin to pull away from the pan. Allow the cake to cool on a wire rack for 1 1/2 hours before inverting onto a cake platter or plate. Allow to cool completely, about 2 more hours. 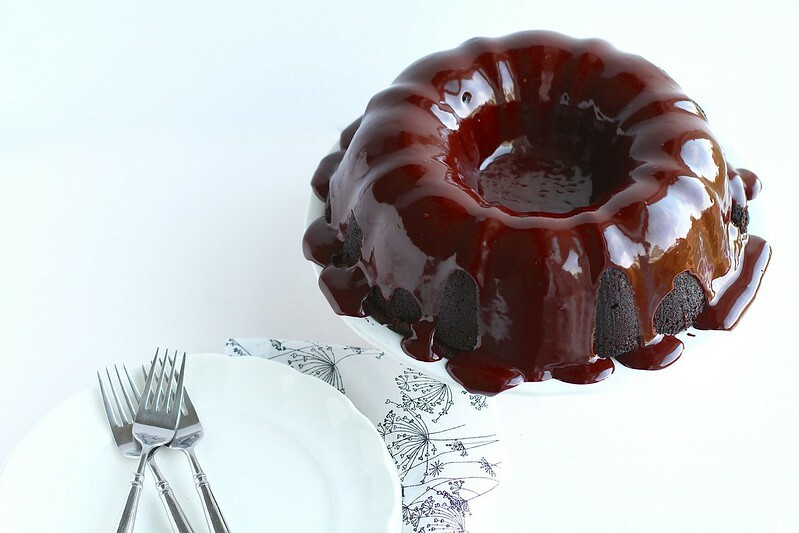 To make the glaze, combine the cream, corn syrup, and chocolate in a small saucepan. Heat over medium heat, stirring frequently, until smooth. Mix in the vanilla extract. Set aside for about 30 minutes, until slightly thickened. Drizzle the glaze over the cake and let set for at least 10 minutes before slicing.